This Wednesday head out to the Irish session at McNeill’s Pub in Brattleboro. Below is some information on it written by flute and whistle player, Dan Restivo. Currently, I co-host the monthly second-Wednesday session at McNeill’s Pub in Brattleboro. Originally founded by fiddler Randy Miller and guitarist Roger Kahle, its first home was McCliment’s Pub in picturesque Putney, VT. A little while back, the session relocated to Brattleboro and I occasionally assisted Randy and Roger with session-hosting responsibilities. In its current monthly evocation, I co-host each month accompanied by either Randy or Roger dependent upon their availability. Vermont is a state rich with traditional music and musicians. There are a wide range of influences including Shetland, Swedish, Scottish, Irish, Cape Breton, New England, Quebecois, etc. Many of these traditions join and are adapted for the abundant contradances that are much loved events around here. McNeill’s Pub offers a variety of sessions each month dedicated to specific traditions within this panoply of traditional hues. 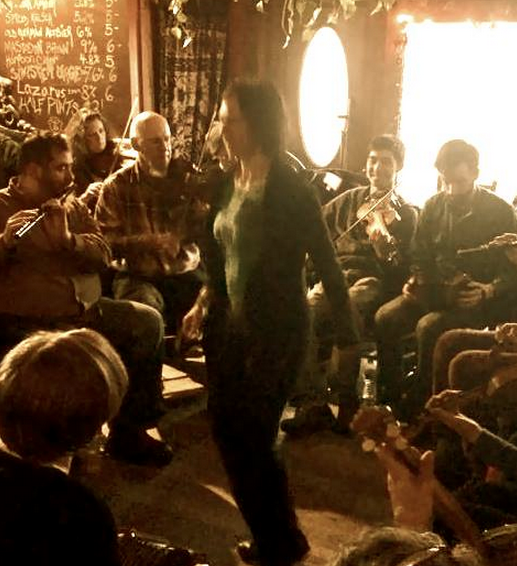 As such, the second-Wednesday Irish session focuses on Irish traditional music and the relevant style. While the rare Scottish, Breton, or Cape Breton tune may find its way into a set of tunes, the format, instruments, playing style, and predominant repertoire are from traditional Irish sources. Who goes to the session? Some great players attend and, particularly as the night waxes on, the repertoire may occasionally branch out towards more obscure melodies and tempi can sometimes get fiery; however, all players are welcome and everyone will be called on at least once to call some tunes. There is a general understanding that the caller of the tune sets the speed and it is up to the rest of us to listen keenly and do our best to ‘lock in’. As well as dance music (and even the occasional dance), we welcome the occasional traditional song. Songs, sung in both English and Irish (though it’s rare to hear gaelic spoken or sung locally), are a vital and important part of the broader Irish music tradition. At the session, it’s common to hear around two to four songs through the run of the evening depending upon the prevalence of singers and the whim of the hosts. The acoustics in McNeill’s can be challenging at times so listening while playing is tantamount for good music. On busy nights, Roger or Randy may bring an amplifier just to provide some extra support for “locking in” … but I play pretty loud so I just encourage folks to lean in! Are rhythm and percussion players invited? Some sessions discourage backers and rhythm players from attending without an invitation, as traditional Irish music is primarily melody-based. The McNeill’s session welcomes competent backers but asks all rhythm players to defer to the time-feel and chords of the host rhythm player if such is extant. In cases where the hosts are playing melody, it is customary for only one guitar to play at a time. In the case of multiple rhythm/chordal instruments, please ensure coordination so as to avoid harmonic/rhythmic dissonance. (In the case of percussion, please stick to bodhrán or bones as per the tradition and adhere to one player at a time taking turns accordingly). If I do say so myself – and I do! – the McNeill’s Pub session is a grand gathering of the local music community (and some farther flung visitors on occasion) with its own brand of ‘craic’ and a great bunch of regular musos. I hope you’ll come out, say hi, and see for yourself! Dan plays timber-flute, whistle, and is known to sing a song or two once and again. Raised, and currently based, in southern Vermont, Dan, also spent nearly half his life – and still part of each year – in Toronto, Ontario, Canada where some of his most influential living musical influences currently reside, including Co. Down Uillean piper Deb Quigley, Galway button-accordion player Ena O’Brien, and France native, fiddler Patrick Ourceau. Dan first began his Irish music journey under the auspices of a research grant from the Canada Council for the Arts which took him to Ireland for three months. After becoming surprisingly enamored with the subject matter, he couldn’t tear himself away and it wasn’t until three years later that he returned to North America with a huge backlog of musical homework and promptly set to it. He’s been dedicated to playing and teaching Irish traditional music ever since. For more information or to inquire about upcoming performances, classes, and lessons, please feel free to email danrestivo@gmail.com. Set Dances, Hornpipes and Mazurkas, Oh My!